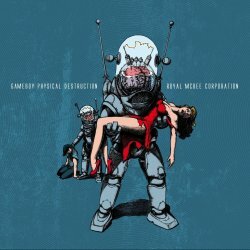 A short half year after their EP Due, Royal McBee Corporation is back with a split record with Lyon based Gameboy Physical Destruction. Available on vinyl 10” and on CD, the record starts with two songs from Gameboy Physical Destruction, a duo sharing guitar, vocal and programming duties. On stage they are joined by a live clown! Thanks to the presence of guitar and bass, their music has a general noisy punk feeling, with occasional gameboy’ish parts that help add some weirdness to set them apart from your regular punk rock band. Both tracks leave a pretty good impression, making you hungry for more gameboy noise punk from these crazy Lyonnese guys. Royal McBee Corporation offer only one track, but their contribution Mechanical Addiction is nearly seven minutes long. Unlike the wilder material on their preceding EP, this song comes with more melodic bass playing, which actually works in the band’s favour. The slower beat allows for more playing around and even doubled bass tracks in order to add more melody to the song. The duo can therefore pride themselves of a more mature approach that leaves you wanting for more.